The KONG Zoom Groom removes loose hairs and massages your dog while you brush it. This brush can also be used to apply and massage shampoo into the coat. 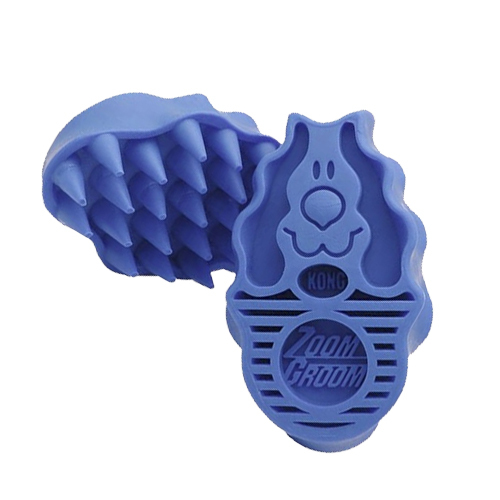 The KONG Zoom Groom is a rubber brush for your dog that is easy for you to hold. This brush is suitable for both long-haired and short-haired dogs. It removes loose hairs like a magnet and massages your dog while you brush using circular movements. The studs of the Zoom Groom go through the coat and onto the underlying skin and gently comb out dead hair and dirt. The brush stimulates the hair follicles and the natural oil production. This can contribute to a healthy skin and coat. The KONG Zoom Groom can also be used to apply and massage shampoo into the coat. Have you used KONG Zoom Groom before? Let us know what you think about this product.